Open the file saved in Tutorial 1 with the File → Open menu command (shortcut key Ctrl+O) or with the tool. 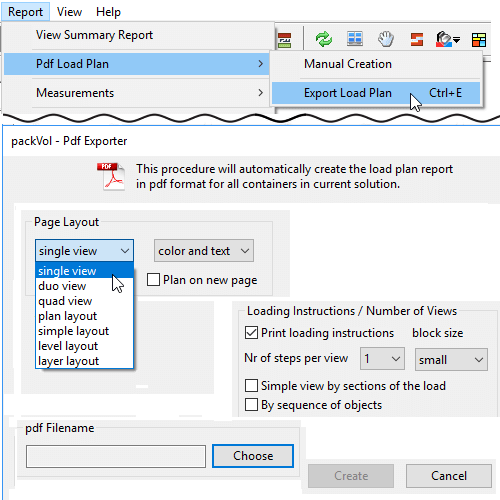 Press the Report → PDF Load Plan → Export Load Plan menu command (shortcut key Ctrl+E) or the tool. Choose the single view layout from the Page Layout control group. Set Print loading instructions = yes, Nr of steps for view = 1, block size = small. Choose the file you want to save with the Choose button and create it with the Create button. Repeat the creation of the document by choosing a different layout or, when it applies, modifying other settings.